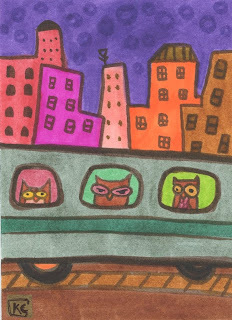 This week's ACEO "Riding the Chicago Owl" is inspired by the Chicago L. Chicago being one of my all-time favorite cities. And public transportation... well, once I watched a dude O.D. on the L... He was literally foaming at the mouth. Good times. Here's a sneak peek at a few 'tween-friendly' sample illustrations for Story Book Arts.